The 2015 British Renal Society (BRS) Conference took place in Leeds, UK, from 30th June 2015 to 2nd July 2015, held in the ‘University of Leeds, Conference Auditorium’. The main objective of the BRS conference is to promote effective patient-centred multi professional care in order to improve quality of life for people with kidney failure. 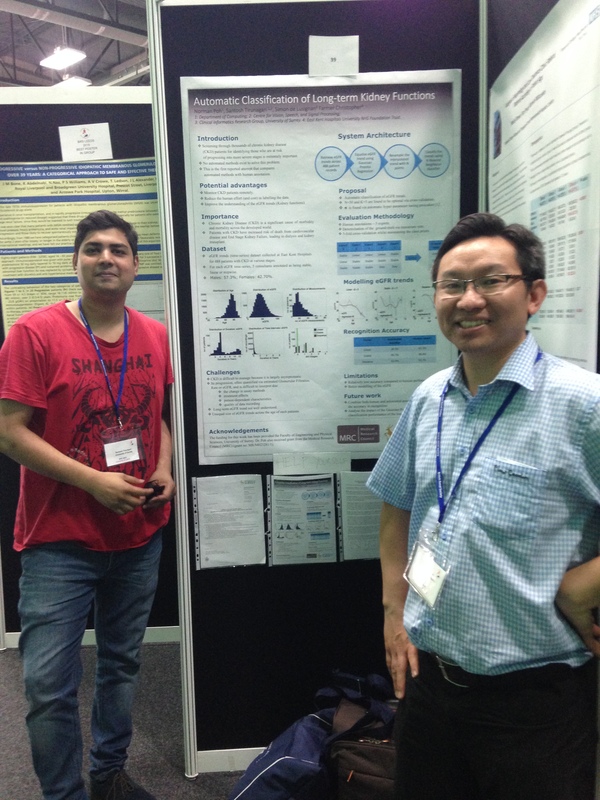 My supervisor Dr. Norman Poh and I attended this conference in order to present our poster entitled : “AUTOMATIC CLASSIFICATION OF LONG-TERM KIDNEY FUNCTION FOR CKD PATIENTS USING MACHINE LEARNING TECHNIQUES: CLASSIFYING EGFR TRENDS” Which is available at . Another reason for attending BRS 2015 is to find potential collaborators who work on renal diseases from the medical field. This is an excellent opportunity because this three-day conference brought together various medical professionals, clinicians, medical device exhibitors and academics working particularly on renal diseases. Therefore, this provided us with an interactive and friendly platform to present our posters, discuss our work with the clinicians, share ideas with each other, and gauge their interest in automated algorithms to solving their problems. More importantly, it was a good opportunity for us to understand the broader technical and clinical problems in managing patients with renal diseases. The main track of the Conference was composed of three types of session, namely, 1) poster session 2) exhibition session and 3) invited talk. On the first day, we registered ourselves at the registration desk in the evening and attended an evening talk on “Designing technology to make healthcare safer” by Prof. Harold Thimbleby who is a Professor of Computer Science at Swansea University. The talk was interesting for me because the speaker discussed how software testing for bugs in the medical devices can help clinicians in saving the lives of patients. The next day, we arrived to the conference at 9 o’clock in the morning to set up our poster. We then explained to the clinicians passing by our poster about our work. In this process we have obtained several good contacts. We had our poster session moderated from 12:20 to 14:20 pm and unfortunately we have lost the best poster award in the group by 1 point. Later in the session, we have had opportunity to attend some of the invited talks and learnt about the work of our peers. Next day, we then visited some of the exhibition centers and also visited the Acute Kidney Injury (AKI) poster session. We were particularly interested in one poster where they have presented their novel algorithm called ‘the Manchester algorithm’. This algorithm would monitor AKI events in real time and alerts the clinicians. We have had a brief chat with the authors and exchanged our contact details for future collaboration. 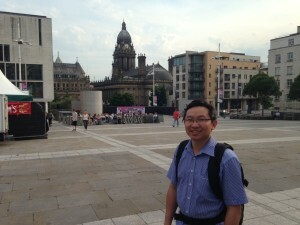 On the final day, we did some shopping in the city of Leeds. We have also visited the biggest Leeds super market as well before taking the bus to return Guildford.